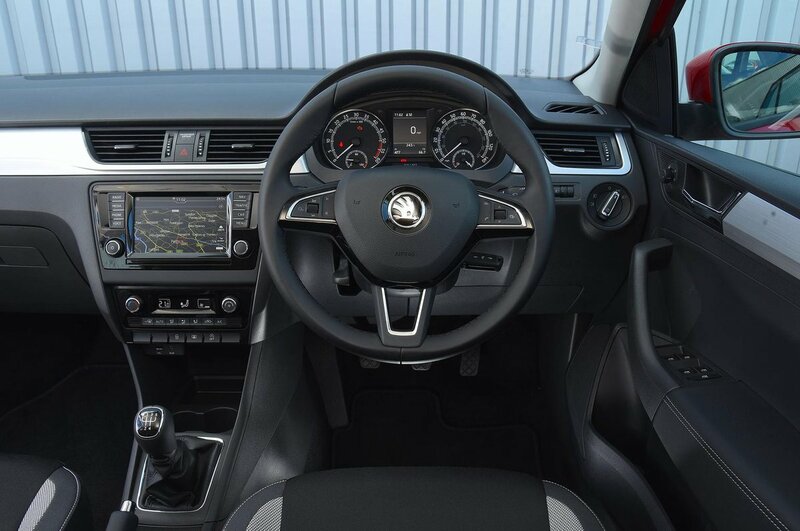 Skoda Rapid Spaceback Interior, Sat Nav, Dashboard | What Car? The Rapid Spaceback offers a sound driving position. There’s plenty of range to the reach and height adjustable steering wheel, and a driver’s seat height adjuster as well. There is some yang to that positive yin, though: the seat recline is operated by a lever rather than the more usual rotary dial, offering a more limited range of angles to choose from, and lumbar adjustment isn’t available. That said, even without it the seat offers decent lower-back support, but its side support is poor, leaving you clinging on to the steering wheel in fast corners. The layout works well: everything from the well-aligned pedals that leave you sitting in a natural gait, to the logical dashboard layout complete with its large, clear buttons. 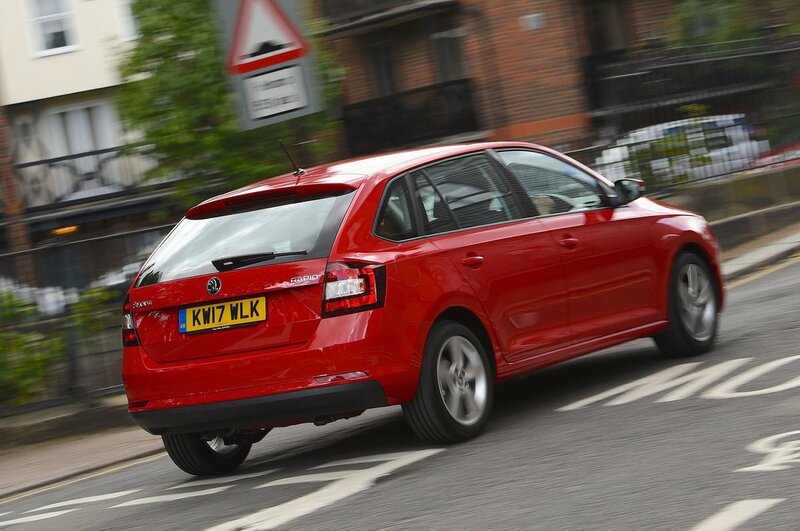 Visibility forwards is good, and while the view rearwards is restricted by thicker rear pillars the most recommendable trim, SE Tech, includes rear parking sensors. All versions come with a 6.5in touchscreen infotainment system. 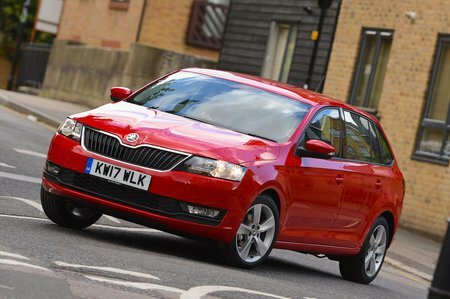 This isn’t one of Skoda’s latest generation and laudable infotainment systems used in models such as the Octavia. Instead the relatively small 6.5in, low-resolution touchscreen feels someway behind the Octavia’s, and those offered in the Astra, Focus and Pulsar for that matter. At least the menus are straightforward to work through and it’s reasonably responsive to commands. On the entry-level S trim you don’t even get a DAB radio but this can be added as an option, and Bluetooth is all present and correct. Sat-nav and a DAB radio are standard on the two higher trims, though. In addition you can upgrade the sat-nav to include online features, such as live traffic and weather reports, plus an SOS feature that puts you in contact with help if you are involved in an accident. Another option is smartphone mirroring. This allows you to connect and operate your phone through the infotainment screen using Apple CarPlay, Android Auto or Mirror Link. We don’t think much of the Focus’s perceived interior quality, but at least in the Ford you get some soft-touch materials on the upper surfaces. Not so in the Rapid. Bar the seats and carpets it’s a sea of hard, unyielding plastics, although everything does feel built to last. At this price both the Pulsar and Astra offer a slightly plusher look and feel inside.